The upper limb tiller is approximately 7 mm wider than the lower limb tiller, however this can be adjusted using the positive packer system. To adjust the Stylist weight/tiller, simply remove the packer locking screw (A), insert one to five packers (B) and replace and tighten the screw. (Increasing the number of packers reduces the draw weight). Place the limb onto the packers, tighten the limb fixing-bolt securely. This will give a tillering mechanism that is both positive and constant. 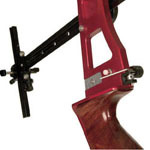 The purpose-made Stylist arrow rest has been designed with all Stylist bows in mind. 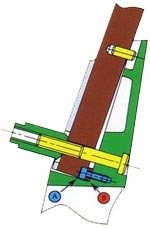 It is easily fixed to the bow with one M4 Allen screw. It is very robust, having a fully adjustable stainless steel wire arm. Its smooth magnetic action is bettered by none. As with all Stylist products, it carries a full year guarantee.